Full disk encryption is expected to be the top security technology to be adopted this year. Take a moment to think about the information that is present on your personal computer, i.e. Photos, passwords, emails, Important documents from work or Financial data and trade secrets. Many of us from the Security Industry obviously have enough confidential and important data regarding our work, source codes, or researches stored in our laptops or systems. We all know Guardian journalist 'Glenn Greenwald', who has written a series of stories in July 2013 revealing the NSA's secret surveillance programs, leaked by whistleblower Edward Snowden. In August 2013, The partner of the Guardian journalist 'Glenn Greenwald', was returning from a trip to Berlin when he was stopped by officers at the Airport under Terrorism Act 2000. He was held for nine hours by the officials and they confiscated electronics equipment including his mobile phone, laptop, camera, memory sticks, DVDs and games consoles. At similar situation, one can physically steal data or install spyware on devices without your knowledge and here only Full hard drive encryption plays an important role in the overall security of your data. The Kali Linux is an advanced open source operating system for penetration testing or hacking, includes a variety of security/hacking tools. In a recent update, The Offensive Security Developer Team behind the Kali Linux has introduced a new security feature called "Emergency self-destruction of LUKS" to their full-disk encryption with cryptsetup utility. If you have an encrypted partition with LVM and LUKS on the Kali Linux, it requires a password at boot time to allow the OS to boot and decrypt your drive, in case your laptop is stolen. But now they have also added a "nuke" password option (user can choose their own secret password), if entered that would intentionally destroy, rather than decrypting the data on your hard drives at the boot time. In an Emergency situation, triggering the nuke password from boot screen will delete all the key slots and makes the data on the drive inaccessible. At this time, this feature is not yet included in the official version of Kali Linux, as the developers are still discussing and voting for whether the nuke feature should be added or not. No doubt, I have voted "YES" along with other 2764 people, because this is an extremely important feature for the hackers and security researchers with Kali Linux. The Law enforcement agencies are "going dark" and NSA, or FBI can anytime ask you to "please type in your password". Of course, you can refuse, but the agent can search you further, detain you longer, refuse you to enter into the country and otherwise ruin your day. Everybody should use either disk encryption or a hard disk password on their laptops. There are many full-disk encryption tools like TrueCrypt, and dm-crypt (LUKS) are available for free to download. UPDATE: Kali Linux team has finally released the latest version of i.e. 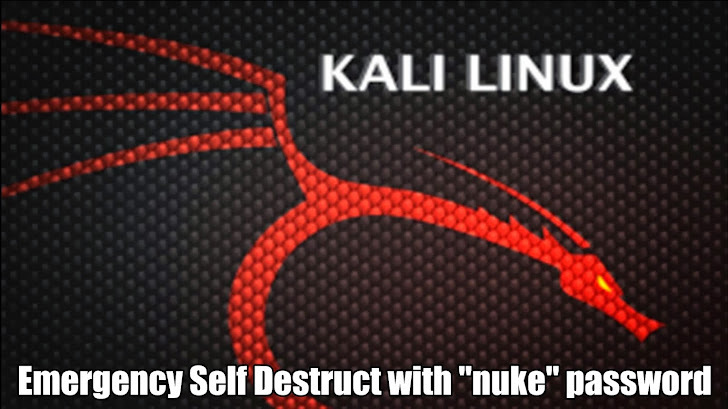 KALI Linux 1.0.6 with an Emergency Self Destruct feature - Download Here.